Dallas architectural titan HKS helps swing the NFL back to L.A. Rendering of new stadium in Inglewood, Calif. 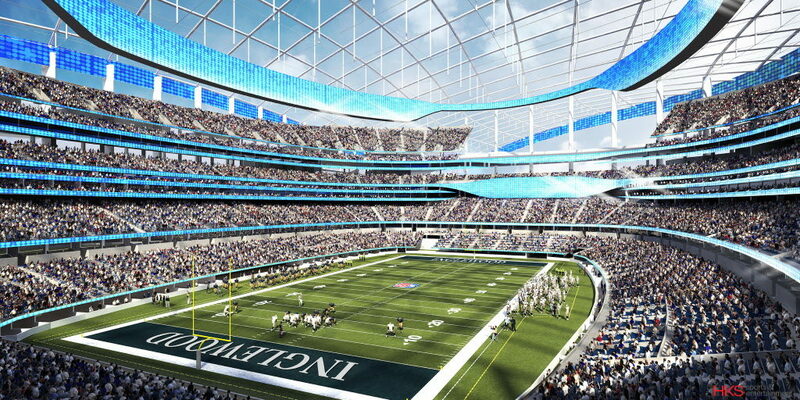 This is an architectural rendering of the new stadium in Inglewood, Calif., one designed by the Dallas-based firm, HKS. The National Football League has voted to have the St. Louis Rams return to Los Angeles and begin play in the new stadium in 2019. The National Football League voted overwhelmingly Tuesday to let the St. Louis Rams move to Los Angeles and construct a lavish new stadium in suburban Inglewood, Calif. The big winners that night, besides the Rams, were the Dallas-based firm HKS and native son Bryan Trubey, its director of sports and entertainment. Trubey, 54, grew up in Oak Cliff. He graduated from Skyline High School and Texas A&M University and then got in touch with his dream. He’s a much-in-demand principal designer being sought after by sports and entertainment moguls all over the world. Not long ago, he presented directly to the ruler of Dubai. The lanky, bespectacled Trubey has served as lead architect for AT&T Stadium in Arlington, Lucas Oil Stadium in Indianapolis and U.S. Bank Stadium in Minneapolis. But his firm’s signature work may be the colossal new stadium in Inglewood, which at the moment exists only in architectural drawings. Even before the first bulldozer fires up at the site of the old Hollywood Park racetrack in Inglewood, onlookers are gushing with praise. Rams owner Stan Kroenke hired HKS years ago, a relationship that began with Kroenke and Trubey sharing a mutual friend. Trubey now oversees two projects in Australia, where HKS is renovating the Rod Laver Arena, site of the Grand Slam tennis tournament the Australian Open. Other ventures have taken him to Copenhagen, Barcelona and Dubai, where he negotiated directly with Sheikh Mohammed bin Rashid Al Maktoum. All of that sounds like tall cotton for an Oak Cliff kid who grew up watching the Cowboys in the Cotton Bowl and Texas Stadium. Like AT&T Stadium, the Rams’ new home will facilitate multiple uses. Its enclosing roof — yes, even in Southern California — makes it a prime contender for college basketball’s Final Four, the College Football Playoff, the Super Bowl, mega rock concerts and a powerhouse lineup of other events. Before it opens in 2019, the Rams will play in their former home, the Los Angeles Coliseum, beginning with the 2016 football season. Soon after the NFL made its announcement Tuesday night in Houston, Trubey flew to Minnesota, where his next stadium creation will be unveiled this summer and where he was interviewed by Sports Illustrated. Then it was back to HKS, where Friday was a well-deserved celebration day, with plenty of new projects to ponder. When you’re hot, you’re hot.